Every employee now has the right to request flexible working hours after the government extended the right previously reserved for carers and those looking after children. As part of the right, employees can expect their request to be considered "in a reasonable manner" by employers. The Department for Business, Innovation and Skills said 20 million people now had the right to ask to work flexibly. Unions and employment groups welcomed the move. The change in the law, which affects everyone with more than six months' service, comes less than a week after the government said it would ban employers from stopping staff with zero-hours contracts - under which employees' hours are not guaranteed - seeking extra work elsewhere. Media caption"All the evidence shows that it is good for the individuals... but also that it boosts the productivity"
The government expects the extension of flexible working rights to be of particular interest to older workers approaching retirement and to young workers looking for additional training while they work. "Modern businesses know that flexible working boosts productivity and staff morale, and helps them keep their top talent so that they can grow," said Deputy Prime Minister Nick Clegg. "It's about time we brought working practices bang up-to-date with the needs, and choices, of our modern families." 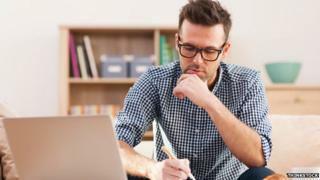 The Chartered Institute of Personnel Development said the change in the law was recognition of the growing importance of flexible working for both employees and employers. "Employers increasingly recognise the strong business case for flexible working, including enhanced employee engagement and the attraction and retention of a more diverse workforce," said the institute's chief executive Susannah Clements. The TUC welcomed the move, but said more needed to be done to ensure that employees' requests were given fair consideration. "When you make a flexible working request you also need a fair hearing, so we should improve things further by giving people a right to challenge an employer's reason for rejecting a request," said the TUC's general secretary Frances O'Grady. Many businesses already offer flexible working to their staff. "We know from our own membership that more than three quarters of our members offer flexible working but there will be a small number of small businesses who just will not be able to do that, whether it's through cost or just from balancing their teams," Liesl Smith from the Federation of Small Businesses (FSB) told the BBC. The FSB has expressed concerns about the additional administrative burden the right to request flexible working might place on small businesses. It has said the right could introduce a "negative dynamic" into the workplace, particularly in the case of unsuccessful requests. Flexible working rights for all - could they backfire?